Joseph Vella from Mellieha is the first Maltese chef to be bestowed with the title of Disciple of Auguste Escoffier in recognition of his contribution to the International Culinary Community. The honour was conferred to Chef Vella at a special ceremony which took place in Reggio Calabria, Italy recently. 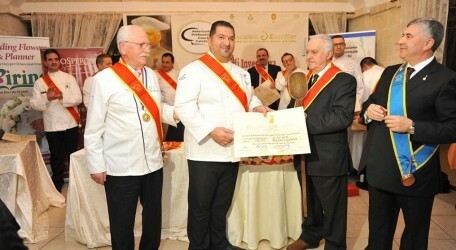 During the ceremony Chef Vella received a wooden spoon and certificate from Francesco Ammirati and Antonio Tocasso, President and Secretary General respectively of the Italian Delegation of the Order, in the presence of Philippe Onofri, International Treasurer of the Disciples of Auguste Escoffier. Named after the legendary French chef, restaurateur and culinary writer, this honour gives Mr Vella the role of Culinary Ambassador and the right to recommend other dedicated Maltese chefs to receive this prestigious title in the future. Founded in France in 1954, the Disciples Escoffier now has chapters in over 25 countries all around the world. With its primary aim for the transmission of culture and the modernity of the kitchen, the Association promotes training, friendly relationships as well as creating a positive learning atmosphere for chefs. Chef Vella has worked in some of the greatest restaurants in Europe including La Marquette in Belgium and the Michelin starred Windows on the World, at the Hilton on Park Lane in London. He adds this achievement to that of being the only foreign ‘Maestro di Cucina’ of the ‘Associazione Italiana Cuochi Professionisti’ (Italian Professional Chefs Association). However, this befitting accolade is also in recognition of the work Mr Vella has done to train and mentor young chefs who today have become some of the leading executive chefs and patrons in Malta and abroad. Chef Vella led the National Team of Chefs of Malta as team captain and manager for 5 consecutive years, successfully competing prestigious international competitions and has also served on the judging panel of many culinary competitions around the world. On the back of this success, in 2009 Mr Vella became the founder and Director of ChefMalta with the aim of providing learning and training opportunities to young enthusiastic chefs to strengthen their knowledge and practical skills and participate in prestigious culinary events.